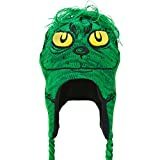 Grinch hats are ideal for fans of Dr Seuss's most grumpy character. Here are some Grinch hats for a cold day, for the kitchen and something special for Halloween! The Grinch - Who Is He? The Grinch is the grumpy, Scrooge-like, character who stars in the Dr Seuss book, "How The Grinch Stole Christmas". This enduring book has also been adapted into a cartoon and a movie, which starred Jim Carrey. The Grinch lives in isolation on Mount Crumpit and despises the happy Whos who live in the nearby town of Whoville. The Grinch decides to spoil Christmas for the Whos by stealing their Christmas gifts, but is eventually redeemed by a young Who called Cindy-Lou. Whilst the Grinch is a miserable and grouchy character, there is also something loveable about him which has made him one of Dr Seuss's most famous characters. The Grinch hates Christmas and everything it stands for so he plans to spoil the Whos' celebrations by stealing their Christmas gifts. This one is my favourite. 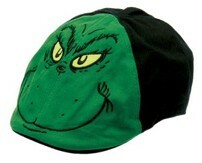 Keep you head and ears warm with this Grinch hat with ear flaps and tie-ups. I have a hat like this of a Panda that I bought in Thailand when a baby Panda had been born in the zoo and everyone had gone Panda mad. However, this evil-eyed Grinch version may just be the thing I need to replace my old Panda version. One thing I can guarantee from experience is that when you wear a hat like this you will get attention. If that is what you like, then this Grinch hat is for you! 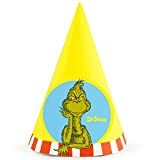 If you are having a party with a group of Grinch fans then these party hats are just the thing! They come in a set of eight so that everyone has got one for the party or if sitting around in a silly hat at Christmas is part of your family tradition then here you go, Grandad will look suitably silly in one of these! This is cute! A chef's hat covered in pictures of Whos from the story of How The Grinch Stole Christmas. 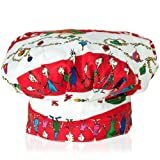 If you are cooking some Christmas treats this is a fun hat for Dr Seuss fans to wear whilst doing so. Alternatively it is an amusing item to wear if hosting a Dr Seuss themed party. If you know a Grinch fan who likes cooking, this is an ideal gift at Christmas. 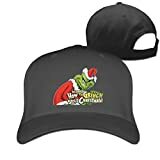 Baseball caps are pretty fashionable these days so it is fitting that there is this nice Grinch design available on this one. This is the cartoon/Jim Carey version of The Grinch who is looking particularly mean in this pose. This cap is available in six different colours; white, ash, black, pink, red & "natural". 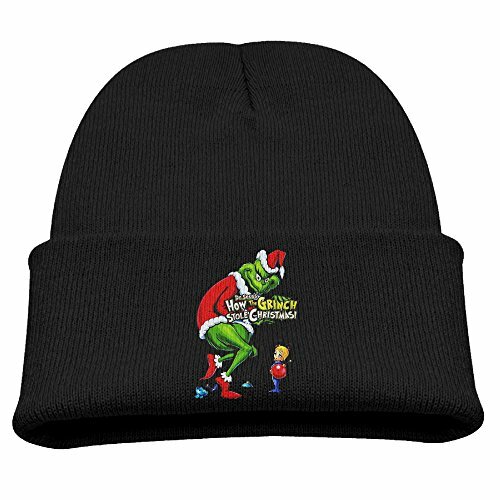 These Beanie hats are good for keeping your head warm in cold weather and they also seem to have had a revival in terms of their trendiness so for any small Grinch fan this is a nice way to keep warm when playing in the snow. Available only in black the hat features a nice picture of The Grinch in his " Ol' Santy" costume with an sad-looking Mary-lou next to him. This Grinch mask and Santa hat is truly spooky with this manic Grinch stare and grimace, making it perfect for wearing at halloween. Of course, the Grinch story is a Christmas one so this mask is also suitable for livening up your family celebrations at this festive time of year. This Grinch mask is made of latex and has green "hair" attached with hand-painted face details. The Santa hat tops of the Christmas Grinch look! This Grinch mask is part of a complete Christmas Grinch costume. Where Would You Wear A Grinch Hat? Grinch ornaments for Christmas can be found here! These Grinch Christmas ornaments are a great way for Dr Seuss fans to decorate their house at Christmas. Cute T Shirts featuring Dr Seuss's Thing 1 and Thing 2 from the classic book, "The Cat in the Hat". Dr Seuss party hats for kids can be found here, with Dr Seuss hats featuring characters such as The Grinch, Cat in the Hat and One Fish Two Fish. I would wear on on a train. I would wear it in the rain. lol Love this! I love Dr.Seuss! I think these hats are very stylish. Love them all. I know just the right person for that Grinch hat! I live in northern Maine, where EVERYONE still wears hats with flaps. Who wants frostbite on their ears! So I'm always on the lookout for cute hats with flaps. Thanks for the suggestions. Very cute selection of Grinch Hats. My fave is the little cheff hat! Poster prints of illustrations from Dr Seuss's Green Eggs and Ham are available to buy and are a great way to brighten up the house. Information on Dr Seuss's original Lorax book and the spin off books that also feature the character, The Lorax.